When it comes to ERP support services in healthcare, not making a decision can be as costly as making the wrong decision in purchasing, maintaining or upgrading ERP system applications. Healthcare ERP systems have largely been neglected as hospitals have invested instead in electronic health records (EHR) to meet meaningful use mandates. Conflicting priorities like the ICD-10 conversion and data security have also collectively siphoned off what little has remained in health IT budgets. The resulting dearth of funding for ERP systems in healthcare organizations has forced hospitals to defer maintenance and delay upgrades, thereby impairing performance and in some cases compromising security. The costs associated with ignoring business applications for the sake of clinical IT upgrades will continue to mount as productivity is stunted and ERP vendors release new versions of their applications, thus bringing older systems closer to obsolescence. An updated healthcare ERP system can help an organization improve patient care and better compete in the marketplace. With access to thousands of ERP solutions professionals experienced in healthcare applications and a proven methodology for providing the best candidates for your organization, HCI's ERP Support Services Division is best positioned to help you update your ERP system. Improve business operations by tapping into the advances made by primary healthcare ERP vendors, such as PeopleSoft, Infor Lawson and McKesson ERP Healthcare Solutions. Save money by upgrading your healthcare ERP applications before the next version makes it even more expensive. Stem attrition among your health IT staff by hiring ERP professionals experienced in the latest Human Resource Management Systems (HRMS), Financial Management Solutions and (FMS) Supply Chain Management (SCM) modules. As part of one of the nation's fastest-growing companies, HCI's ERP Support Services Division works with hundreds of healthcare systems around the U.S., many of which are beginning to fund major initiatives with their ERP applications. Neglected systems are a principal motivator, as evidenced by a poll of healthcare CIOs in which respondents ranked ERP improvements among their top three initiatives. With extensive experience supporting healthcare providers with staffing for EMR projects that improve their clinical operations, we can use our intimate knowledge of organizations to assist them in upgrading ERP systems to improve their business operations. Even if you have deferred investment in your healthcare ERP system in recent years, HCI's ERP Support Services Division can help you improve critical applications like GL, AP, Procurement, Purchasing and HR/Payroll by providing you with the ERP professional that is most experienced and skilled in working with the vendor and module you have chosen—and who is best suited for your organization. Control costs, improve productivity and tighten security by upgrading your healthcare ERP system now. If you do not, lack of action could prove to be the most costly action of all. "HCI has been an outstanding partner for UCSF. They have taken the time to truly understand our organization's needs & culture to design the right solution. We have found them to "think out of the box" as we focused on refining our sustaining support model while creatively infusing ITIL principles into the framework. We have found the HCI resources to be stellar individuals who bring with them healthcare IT experience, expertise and integrity." 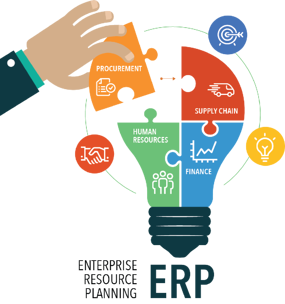 We can help you make make the right decision on your ERP system.